There are many options on the market for enterprise communications. It’s easy to get distracted by nice-to-have features and easier still to get bogged down in competitive pricing. The problem for VoIP resellers is that they need to be confident in their service offering right from the first pitch. To determine if your offering is a modern and capable voice system that’s reliable and flexible enough to last, you should check the following criteria before making a recommendation to your customers. F, 0-5 points: It looks like you’re probably on an older system and don’t have much to work with in terms of virtualization. If that’s true, it’s also probably safe to assume that you’re working in a fairly analog environment and have to make hands-on changes to coding and network hardware. You’re operating with high costs, a temperamental system, and not much in the way of customer satisfaction. Competition is going to be really tough unless you make a change to your offering. D, 6-11 points: You’ve got some tricks up your sleeve and a few features to offer, but your reliability may leave some customers wanting. You’re most likely able to win over customers on price in most cases, because the other platforms out there can offer more features to the end user. With price, however, you can only get so low… and the entire industry is locked in a “race to zero.” When you lose your one big competitive advantage, it’s going to be difficult to keep customers attracted. C, 12-13 points: You’re doing well enough. The platform is pretty stable, your long-time customers are content, but you can’t seem to edge into any bigger markets. SMBs are your safe targets. Those customers aren’t interested in anything fancy. They just want their calls to connect. You’ve nailed down selling your value in terms of reliability and customer service, but you’re losing a lot of opportunities to more feature-rich systems. B, 14-16 points: You’re operating on a pretty solid system. You have some additional features to offer and your account management is relatively easy to handle. The drawback is that IT is required for simple changes, and complex changes are impossible. Every so often you’ll get support calls and have to say, “we can’t do that.” Your most satisfied customers are the ones that don’t know or don’t bother to look for other solutions, and that’s just fine by you. A, 17-18 points: Congratulations, you’ve got a great voice offering in your hands! With a nice balance between scalability and flexibility, you know that when your customers sign on, they’re not going anywhere for a while. Anything they need assistance with is easy to troubleshoot because of your real-time insights into system health, and you can even respond to custom requests for additional features with relative ease. The platform is reflective of your value as a reseller, and you can confidently go toe-to-toe with the biggest players in a competitive scenario. Clearly, customer demands for a flexible and reliable business voice solution have gotten more complex over time. As the bar for business technology just keeps getting higher, it’s important to take action and stay ahead of the curve to ensure your customers’ success. 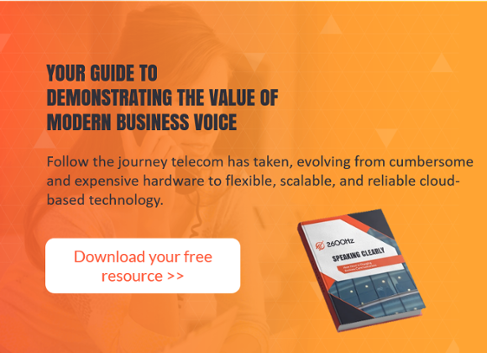 Searching for the right platform to offer your customers can be easier if you can identify the modern standards for cloud-based VoIP. Learn about where telecom started out and what users and administrators expect of their platforms today in the free eBook, Speaking Clearly: How Cloud is Changing Business Communications. Click here to get your resource now.